16th century shop and literary landmark. With its precarious overhanging upper storey, uneven floorboards, sloping roof and wooden beams, this 16th century building warrants its title as probably the oldest shop in central London. 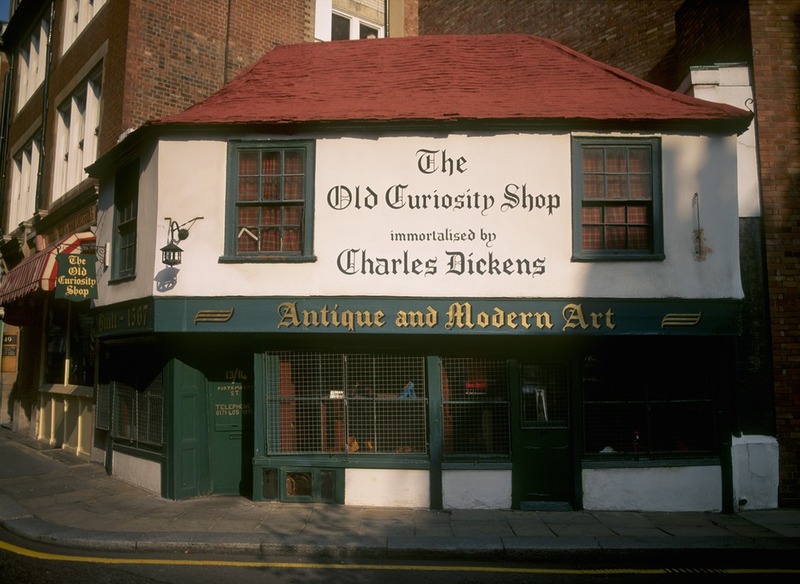 It also fits perfectly the image of Charles Dickens’ creaking, half-timbered ‘Old Curiosity Shop’. While some doubt has been cast over the assumption that the shop was the inspiration behind Dickens’ novel of the same name, the building certainly does a very good job of convincing sceptics otherwise. At one time it functioned as a dairy on an estate given by King Charles II to one of his many mistresses. Made using the wood from old ships the building miraculously survived the flames of the Great Fire of 1666 and the bombs of Second World War. Still functioning as a shop (an upmarket men’s and women’s shoe boutique at the time of writing), the building’s future and architectural heritage is now protected by a preservation order. Dwarfed by more recent architectural constructions, the shop is often literally overlooked by tourists and locals alike but is worth seeking out if you’re in the area – especially if you need a new pair of shoes. Pay a visit after exploring Lincoln’s Inn Fields, the Inns of Court or John Soane’s Museum. Creaking floorboards, wooden beams, Charles II, Dickens and shoes. Charles Dickens lived at Bloomsbury and knew the area surrounding the shop very well. He was known to have visited the shop on a number of occasions. What are the best dining options near The Old Curiosity Shop London? The Old Curiosity Shop gyms, sporting activities, health & beauty and fitness. The best pubs near London The Old Curiosity Shop. The Old Curiosity Shop clubs, bars, cabaret nights, casinos and interesting nightlife. Where to have your meeting, conference, exhibition, private dining or training course near The Old Curiosity Shop. From cheap budget accommodation to luxury 5 star suites see our special offers for The Old Curiosity Shop hotels, including The Waldorf Hilton Hotel London from 76% off.